danceScape.com forums.danceScape.com Forums - Live, Love, Laugh ... Dance! danceScape SkyhiClub Lounge: Welcome to the Skyhi Life! FASHION Men's Tail Suits Online from only US $995 ... Brackley's & Arthur Ashmore! Men's Tail Suits Online from only US $995 ... Brackley's & Arthur Ashmore! Men's Custom Tailsuits (from only US $995) are available for ordering online at DanceScape's " www.dancescape.TV/paradise"! Arthur Ashmore Tailors have been making suits for competitors and champions alike worldwide, which have included Luca Baricchi. Dance Pants designs and manufactures trousers for Social Dancing & Ballroom Competitions. The company has the largest in-stock supply for fast 1 day service. Or, customers can have "made-to-order" pants within 10-14 days using your supplied measurements. Arthur Ashmore Tailors is planning to come to Toronto, Canada in the New Year (Jan/February timeframe). If you would like an appointment for a fitting, please call +1 (905) 633-8808 or e-mail info@dancescape.com . "Given where I live, I had little choice but to purchase my Brackley's Tail Suit online. My fears were overcome by all the attention and care given me by DanceScape, including the answering of all my questions. And the tail suit fit me perfectly." 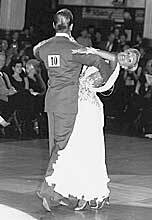 "DanceScape provided us dancers with a great opportunity to order the best ballroom tail suits in the world without travelling to England. Ordering process was smooth, it took a while to get the suit from England but DanceScape was able to track the order and keep me updated on the order status. In any case, I allowed about 10 weeks for the whole process and my tail suit was here about a week before the comp. "Special thanks to Brackley's, the tail suit fits almost perfectly. I was amazed that they were able to do such a great job just taking my measurements over the net! "International customers, beware of customs costs, about $60 extra in my case. Overall, I should say it was a good experience. I wish DanceScape get more "high tech" and provide online order tracking as well as exact pricing online. This being said, I am definitely using DanceScape for my online purchases of dance-related items in the future. Keep up good work!" "The folks at DanceScape provided me with the best custom-made tailsuit ordering experience I have ever had. Before placing my order, they provided me with a price quote, samples, and a timeframe to expect my costume to be completed. They were there to answer all my questions throughout the process, kept me updated on the status of my order overseas, and delivered the product when they said they would. Also a special note of thanks to the tailors at Arthur Ashmore, they did a spectacular job! I will definitely call DanceScape for my next Arthur Ashmore tailsuit." Congratulations to Brackley's, a Select Vendor of DanceScape which has once again been selected as the official men's tailor for "Strictly Come Dancing" (the original United Kingdom version of "Dancing with the Stars". Brackley's has been turning out superior tailsuits for our members and within 2 to 3 weeks! Congratulations, Tony, and everyone from Brackley's! Great one!! keep it up. Quick Reply to: Men's Tail Suits Online from only US $995 ... Brackley's & Arthur Ashmore!